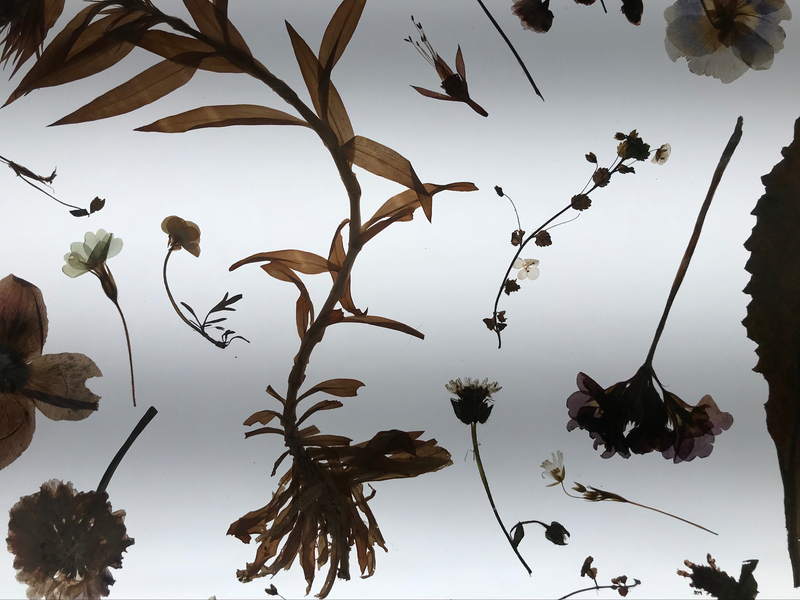 A series of short films of a fish tank full of tropical fish, a display of pressed wild and cultivated flowers lit from beneath. These are the first things you encounter in Edmund Clark’s exhibition In Place of Hate based on his 3 year residency at HMP Grendon, the UK’s only therapeutic prison and Europe’s only fully therapeutic prison. Clark is well-known for his work in Guantanamo as well as other projects around incarceration and detention. He often juxtaposes the administrative bureaucracy of indefinite detention with the intimacy of daily life lived within its conditions. The Ministry of Justice have made strict provisions about what can and cannot be shown and inmates need to remain anonymous to protect both them and the identities of their victims. Yet Clark finds multiple ways to represent the space of the prison as one of life and humanity in a way that avoids or even contests the voyeurism of much prison photography and aesthetics. This is not to say he doesn’t also draw on certain staples of conventional prison representation such as its architecture but the overall sense is how the architecture of the prison constitutes just one element of the carceral experience. Where in some prisons particularly maximum security facilities, architecture plays a more totalising role as inmates are kept locked in their rooms for 23 hours a day, at Grendon there is a far higher level of human interaction in the form of group and individual therapy sessions, education programmes and psychodrama and other creative activities. This poses the question as to whether in such a context, the architecture becomes circumstantial as is the case with other municipal buildings. The pressed flowers play an interesting role here. They challenge the concrete and red brick brutalism of prison buildings and the municipal washed out colour of the bedsheets. The gallery guide told us that Clark like the transparency produced by the pressing process which reminded him of the processes at Grendon. Entitled 1.98m2, the flower display is shaped around a square which reproduces the dimensions of a cell at Grendon. It reminds us that despite the activities outside the cell, it is still a prison where people are confined. In contrast to the flowers and fish, a dark side room in the exhibition comprises of a series of vertical oblong screens, Vanishing point, featuring video footage of the grounds and the interior of the prison, housed in a former hospital building, taken by Clark during his residency. The videos are of varying length ranging from a very short (poss less than 30 seconds) shot taken down a corridor to the medical centre to an 18 min video filmed around the perimeter of the grounds. There is a clear dissonance between the spaces such as the perimeter that Clark could ‘explore’ and the routes taken on a daily basis by the inmates. The corridor leading up to double doors marked Healthcare is perhaps most striking here as we are reminded of the physical and mental toll of incarceration on human bodies, the shortness of the film means we see its cycle more frequently than the other films itself suggestive of the frequent and often futile as well as banal visits by inmates to the medical centre and the limitations of the support they receive there. But we are also reminded that we, the public, have restricted access to this world, we are shut out at the doors, the poster about flu jabs fading into darkness before we can finish reading it. Other footage of the outside involves pixelation which one might first assume is people, a bit more attention and it becomes apparent no one is there. The pixelation is to protect the prison and its security from our gaze. Clark has ingeniously used MoJ restrictions to challenge the gaze of the penal spectator and the assumption of our claims to innocence and objectivity when we seek out images of incarceration for entertainment or cultural consumption. A similar challenge is in play in My Shadow’s Reflection. Green bedsheets like those used in the inmates’ cells are used as projection screens and images of individual flowers, prison architecture and pinhole photographs of inmates appear in random configurations. The multiple projectors positioned around the room mean there is no way for visitors not to cast their shadow over the images. The guide who gave us a short tour suggested that Clark wanted the shadows to act as a reminder of both his and our privilege. Caught up in a certain chain of events anyone of us could end up in prison. To me it also evoked the way in which we cast shadows of judgment over others and how prison functions as both an end point and starting point for such judgment. Clark uses pinhole images of inmates to get around the need for anonymity. They were produced by having the inmates sit for about ten minuted while talking about themselves. The process and the goulish apparitions the pinhole camera tended to produce reminded me of the photography produced by Charcot in La Salpêtrière. But here there is a complicity and investment from the inmates unlike the passive (and sometimes forced) acquiescence of Charcot’s subjects. Inmates gave permission for their images to be projected. In the adjacent resources room, their commentaries are presented along with printed versions of the images which the inmates have ‘personalised’ or decorated. The blurred, ghostly images become imbued with a fluidity or shapelessness that provides the potential for change or interpretation compared to a sharper image. One inmate compares this to a baby with wrinkles which will smooth out as he becomes formed as a person. The ambiguity of the pinhole images provide the chance to be formed again. In the middle room which preceded the room of projections, chairs like those both used and manufactured in prisons are arranged around a set of tv screens showing footage from a psychodrama session based in the trilogy Oresteia written by Aeschylus in 458BC. I liked this the least. But the point isn’t to like it. Visitors are invited to sit down in a formation that resembles the therapy sessions inside Grendon. Your gaze gets caught up in that of the other visitors. At first you wonder if you’ve walked into an education programme by mistake. Then if you do take a seat, some second guessing towards the other seated visitors inevitably takes place – of motivations for being there, some judging of other visitors clearly just wanting a seat, chatting with a friend or checking their phone before they go to the gallery shop or cafe. But then there are those watching intently. You don’t necessarily want to watch the full 74 minutes but when do you get up? What is appropriate? If anything the experience affirmed my hatred of the type of group activities we sometimes get asked to do at work which I find deeply infantilising. But then watching the video something else also happens, regardless of what they thought of the play or the incredibly posh educator leading the session, the inmates all engaged seriously and all used the session to articulate their thoughts and feelings around their crime. They all wore masks to protect their identity and had different interpretations of what it means to ‘wear a mask’. One inmate said most tellingly that having learned to express his emotions and tell his story he also realised that the work involved in getting to that point also meant that he wasn’t willing to give it up that easily to just anyone, that for him to open up would require some kind of reciprocal work to build respect and confidence. That seemed to me the most important thing to take from the exhibition. There might be a desire to understand more about the experience of those in incarceration and their lives before that but a willingness to understand is not enough. A greater labour of care is required, a greater commitment towards the person sharing that experience is necessary even though this cannot be defined in advance and should definitely not be qualified as a straightforward transaction. Running concurrently with In Place of Hate at the Ikon was another exhibition on the artwork of Thomas Bock, a miniature painter sent to Tasmania (Van Dieman’s Land) in 1823. For an interesting discussion about the juxtaposition of the two exhibitions in the space of the Ikon gallery see Khadija von Zinnenburg Carroll’s article.